↑ (ਚੈੱਕ) ČSÚ – Czech Statistical Office. Czso.cz. Retrieved on 12 August 2012. 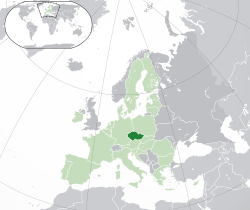 ↑ 5.0 5.1 5.2 5.3 "Czech Republic". International Monetary Fund. Retrieved 10 October 2012. ↑ "Human Development Report 2011". United Nations. 2011. Retrieved 5 November 2011.